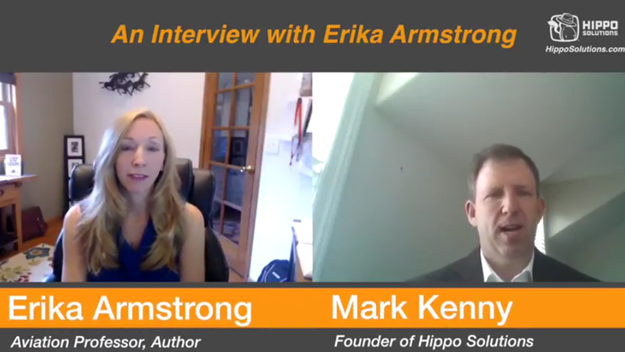 Join us as I speak with Erika Armstrong, from A Chick in the Cockpit. Erika is professional pilot who currently trains other corporate pilots. During our conversation we discuss the challenges of retention in the corporate aviation world. While pilot training requires a huge corporate investment, pilots often use the experience as a stepping stone to other career goals. Erika provides some interesting ideas and insights that can be applied to your own retention issues. Erika Armstrong is author of A Chick in the Cockpit: My Life Up in the Air (http://a.co/buReg7e). Learn more about Erika's work at http://www.achickinthecockpit.com. Learn how Hippo Solutions' 7 step system increases retention, improves performance, and revolutionizes your employee experience at http://www.hipposolutions.com.